The northwest corner of Second Avenue and Thurston Street in Albany on Jan. 9. This collection of stuff off Albany’s Second Avenue and the Thurston Street canal is not going to mar the Central Neighborhood much longer. At least that’s the word from City Hall. Junk and trash are not, sad to say, all that rare in Albany, but this accumulation at 122 Thurston St. S.E. seemed out of the ordinary when I saw it on Wednesday while riding past on the bike. I asked Marilyn Smith at City Hall about it because she’s part of an informal “code squad” that deals with complaints. She checked with Kris Schendel, a code enforcement officer with the police, and here’s what they told me. 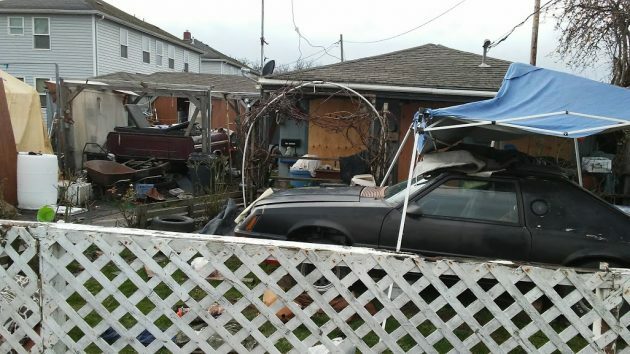 There’s a house behind all that junk, in addition to the RV you see in the photo. The place came to police attention in connection with arrests for drug crimes, strangulation, and assault. There was no electricity, and fumes from a generator greeted officers when they went there on Dec. 20. The house had been without water service since October, and the toilet was full. Four persons were living in the house and three in the RV. Schendel went there four times in December and this month, urging the people to get water service back on. When they didn’t, the house was boarded up on Jan. 3 under the city’s nuisance ordinance due to drug activity, the assault and strangulation cases, lack of water service, and junk and trash. Now what? The woman listed on tax records as the property’s owner is dead, and the place now belongs to her daughter. 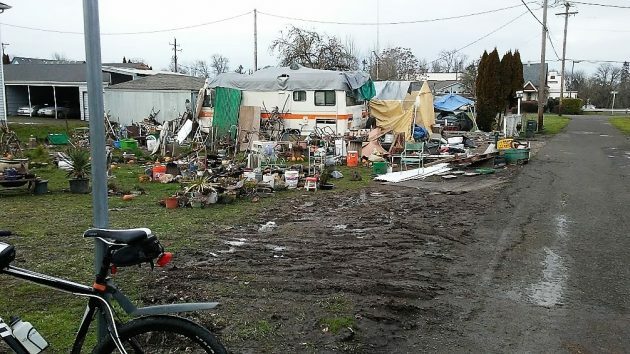 She is reported to be working with the city attorney’s office on an agreement to clean up the property within 90 days, and when that’s done she intends to sell it. Sometimes, the city pays for a cleanup and puts a lien on the property, hoping to be reimbursed if there’s a sale. But not in this case. “We got an estimate of about $6,000 to hire a contractor to clean it up, but she has agreed to take care of that at her expense instead,” according to an email from Smith. As seen from the Thurston Street side. Three months? I’m thinking five gallons of kerosene, and a road flare. Write it off as a “training burn” for the fire department. Then a scoop loader, a couple of dump trucks, one day and there’s an empty lot for sale. I suggest they spray ammonia on the walls. It changes colors then they cooked meth there and it’s a toxic waste site. Wow. I wondered when this would happen. I noticed they had moved to this property. I knew it was just a matter of time before they destroyed the place. They did it to another house already. They were living in a house on Front Ave. This house was demolished when they left. The house was a compound of trash, broken down cars, and what appeared to be lots of meth use. I would say 10-12 people would be in the house with only one car in the driveway. Seemed to be basically a drug den. Hey H.H. that place was a “toilet” for most of the years on the PD. Back then we had some real lame ordinances for dealing with these places. We “chased” a guy at 2nd & Madison for years. Listed owner would claim he sold it to his son. Son would claim he sold it to his mother. Mother would claim she sold it back to the owner. Until our present mayor & council get a back bone & put some real teeth into the City’s prosecutor’s mouth…it’s same-o, same-o. Sadly they’ll move to another location & begin the process all over again. It’s beyond comprehension that so many of these places exist in Albany Lebanon Corvallis even Tangent. “…to knock down buildings” to the Landmark Commission and the offending Historically-Significant dumpsite can be razed. Oh…I forgot….the Council still hasn’t figured a way to comply with State law on that issue. Another day, perhaps. After witnessing the train wreck on Albany City Council, wherein the Mayor, an erstwhile Paddington’s Bear, dukes it out with Krash Kellum, the Mensa Mastermind, it is hard to see how anything will ever be done about this deteriorating situation. Two requirements for group work — a high bladder to brain ratio (thanks Dilbert) and an easily-cleaned BS filter. Thick skin and a long fuse are entry requirements for a council job. I agree. The council act is not unlike All Star Wrassling. Expecting to see someone’s head crashed by a flying chair. Maybe offer the place to the Producers of “Hoarders.” Seems an ideal candidate. I wonder if the Coffin Butte landfill will allow anyone to dump this mess in their landfill. It might inconvenience them as the dumper will get in the way of the out of county traffic. What took so long? That place has looked much the same since way last summer. If the police had been there regarding on assaults, strangulation and drug use why did they not see what a mess it was and begin the process then???? Well, a messy yard isn’t criminal, so the police had no call to act because the messers had the owner’s permission to be there. It IS reprehensible that some shady people took advantage of a little old lady. The sad thing is this place was not always this bad. Years and years ago, when I was a child I used to have picnics and bbqs with my grandparents on that very property that you can no longer see under all this trash. My grandmother who was barely able to get around on her own had these people staying on her property that she believed were helping her. In reality they were trashing the place, bringing drug addicts there and using her property as a junk yard. My grandmother unexpectedly passed away last year and ever since then the yard and house has become a serious issue! This disgusts me to the max, how somebody could turn my grandma’s once home into a dump yard and a tweaker open house! Glad they’re finally gone for good!